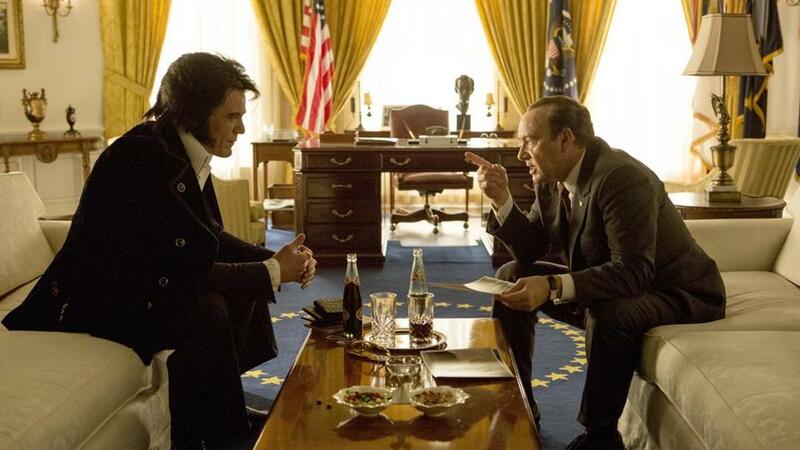 Michael Shannon as Elvis (left) and Kevin Spacey as Nixon. The primary reason to see “Elvis & Nixon” is for the sight of two great actors taking on a dare. And Michael Shannon as Elvis Aron Presley? No. Just... no. Except that Shannon gets you to consider yes, even with those eyes that blaze maniacally where Presley’s lids drooped. This is Elvis as he might exist — still — in a parallel universe, one where he calls the shots instead of the Colonel and where a wacked-out rock star can be a switchblade of energy rather than an indolent wreck. And this Elvis is whacked-out indeed. Directed by Liza Johnson (“Hateship Loveship”) from a script by Joey Sagal, Hanala Sagal, and actor Cary Elwes, “Elvis & Nixon” takes place on one day, Dec. 21, 1970, and lifts off from an actual event, the Oval Office meeting of the president and the King. The photo from the encounter is, per the end credits, the most requested image in the National Archives. The movie speculates on everything that led up to it by lining up one choice absurdity after another. Why did Mr. Presley come to Washington? He wanted to sign up as a federal agent at large, so he could go undercover and ferret out Commies in the counterculture. Why did Nixon bother to meet with him? Because his two young aides, Egil “Bud” Krogh (Colin Hanks, Tom’s son) and Dwight Chapin (Evan Peters), convinced the president that aligning with the fading rock star would make him hip with “the kids.” The movie dramatizes — or, rather, fondly satirizes — a perfect storm of misperceived intentions and cloistered cluelessness. Both men are prisoners of fame who have no idea what’s actually happening in the world. Of course they’d get along. The movie’s genial but surprisingly small potatoes, and it’s telling that there’s none of Presley’s music to be heard in it. Johnson fritters away the first two-thirds of the running time getting her ducks in a row, and some ducks are more interesting than others. As Krogh, young, ardent, and enthusiastically square, Hanks shows some of the zest and comic timing of his father — he looks a lot like him, too — and he’s fun to be around. Sympathetic but less urgent is Jerry Schilling (Alex Pettyfer), an ex-member of Presley’s Memphis Mafia who is called back into the fold to arrange the meeting. Having moved to Los Angeles to live something like a normal life, Jerry’s the only one of Elvis’s inner circle who can be trusted to not screw this up, and Pettyfer renders the character sweet, saintly, and fairly dull. Shannon, by contrast, makes Presley a funny and alarming figure, lost in his fame yet confident that he can get away with anything. And he can — he’s Elvis. Even if youth culture is swinging away from him, the rest of America goes gaga whenever and wherever he walks into a room, loudly in the case of the clerks at the Bureau of Narcotics where the singer vainly tries to get a badge (from a deadpan Tracy Letts as a deputy director), or with freaked-out bureaucratic repression. “Elvis & Nixon” strains itself to bring the title duo together and then relaxes — finally — while Spacey and Shannon perform the actor’s equivalent of a waltz. Spacey finds real comedy in Nixon’s gauche clumsiness, his paranoid resentments and ache to belong; the president takes some convincing, but once he realizes Presley is cool, he wants to be right there next to him. Shannon’s Elvis remains in a veiled, intense alternate reality, and the cross rhythms of the two characters, and the two actors playing them, create delightful interference patterns. And then? Then the scene’s over and, for all intents and purposes, so’s the movie. (Somehow it crosses the finish line without once mentioning Presley’s own addiction issues, an omission that counts as both a missed opportunity and an irresponsible lapse.) “Elvis & Nixon” is a guilty-pleasure hoot that’s also, in a fumbling way, rather sad. Here were two of the most powerful men in American culture, and all they could obsess over were the things they didn’t have. Loneliness was the only thing they had in common. Unfortunately, that’s a whole other movie. With more focus, it could have been this one. Directed by Liza Johnson. Written by Joey Sagal, Hanala Sagal, and Cary Elwes. Starring Kevin Spacey, Michael Shannon, Alex Pettyfer, Colin Hanks. At Kendall Square. 86 minutes. R (foul presidential language).